I was skeptical about using an herbal eye wash. Frankly, the thought of putting herbs in my eyes was uncomfortable. At first glance, it seemed like getting sand kicked in your eyes would be more pleasant. On the other hand, Mr. Joybilee has glaucoma and drops chemicals in his eyes daily. Perhaps organic herbs would be more pleasant than chemicals. I came across an herbal eye formula while I was researching Bayberry. 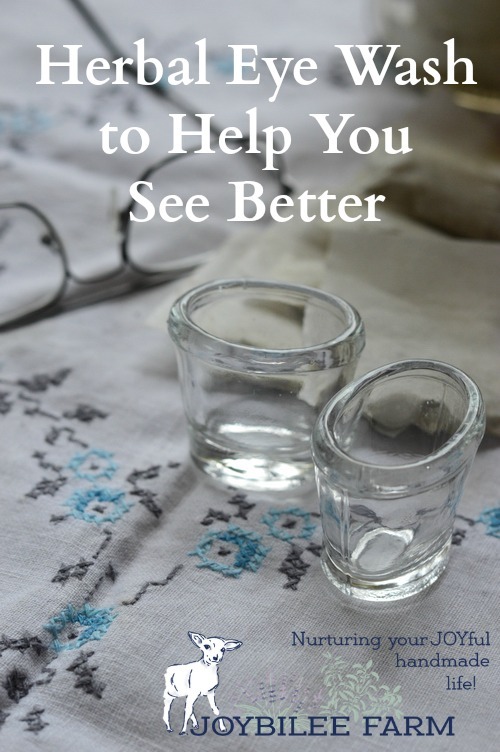 The herbalist John Christopher had a bayberry – eyebright formula for eye troubles. I made up a batch for home use but I hesitated to tell you about it right away. What if it doesn’t work? I needed to test it for a couple months before I shared it. Mr. Joybilee has used the eyebright formula for about 2 months now. He has seen an improvement in his vision. 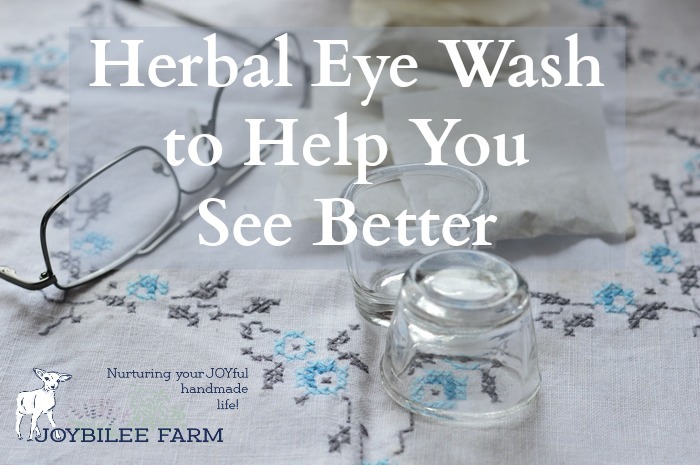 Anecdotal though that is, it’s worth telling you about, in case you wanted to try this herbal eye wash recipe from “Dr. Christopher”. Note that herbalist John Christopher was not a medical doctor nor did he have any advanced degrees. His clients nicknamed him “Dr. Christopher” because they found healing in his recommendations. Dr. Christopher’s Eye Bright Formula is known to clear the eyes, removing mucus, and brightening vision, while it increases the circulation to the eyes. There are testimonials of the healing of cataracts, glaucoma, and other eye problems. This eyebright formula contains just 5 herbs, chosen for their antimicrobial and stimulating actions on the eye tissues. These herbs cleanse, nourish, and rebuild the eyes. It’s important to use the formula regularly for best effect, using it as an eye wash and a tea. In Mr. Joybilee’s case, his low blood pressure was robbing his eyes of normal blood circulation. After using the formula for only a week, he noticed that things he had trouble seeing before were suddenly clear, reading was easier, and he didn’t need to squint to read the small print. We won’t know if it is helping his glaucoma though, until he sees his specialist again in the fall. In the meantime he’s continuing with the prescription eye drops and using this eye wash once a day. 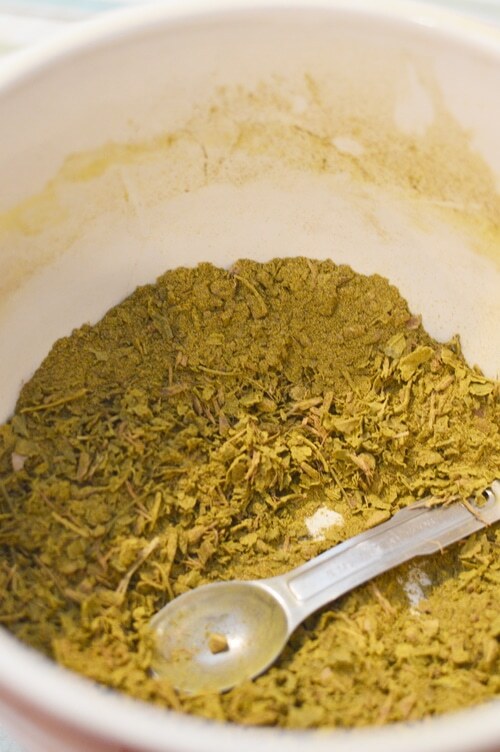 John Christopher’s Eyebright Formula contains several herbs, each with a different purpose. Eyebright herb (Euphrasia officinalis) has been used to heal eye problems since Dioscorides used it for eye problems when he treated soldiers in the Roman Legion. Eyebright is first and foremost an eye tonic. It is anti-inflammatory and astringent, toning the tissue of the eye and relieving pain and irritation. It has been used as an eyewash to treat pink eye, blood shot eyes, conjunctivitis and other inflammatory conditions of the eyes. It is disinfectant. It strengthens weakened and strained eyes. Eyebright was shown in laboratory studies to have significant antiviral, antibacterial, and antifungal activity, when used topically and when taken orally. 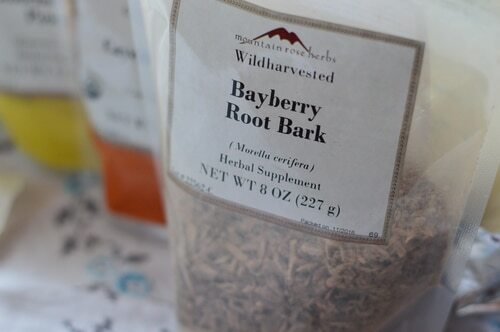 Bayberry root bark (Myrica pensylvanica, Myrica cerifera) is astringent, drying of mucus membranes. It is antiviral, antimicrobial, anti-inflammatory, stimulant, and encourages the growth of new, healthy eye tissue. Red raspberry leaf is the most nutritious part of the raspberry plant. The leaves contain calcium, potassium, phosphorus, iron, manganese, and vitamins A, B, C and E. It is tonic, astringent, antimicrobial, anti-inflammatory, and encourages the growth of new, healthy eye tissue, while it nourishes. Goldenseal (Hydrastis canadensis) contains berberine and is strongly antimicrobial, anti-fungal, anti-inflammatory, and astringent. It is used in this formula to kill infections and reduce inflammation. Cayenne powder (Capsicum annuum) is the fruit of the hot pepper plant. It increases circulation and acts as a catalyst for other herbs. Cayenne powder stimulates the eye tissue and increase the circulation to them. The cayenne powder causes this eye wash to sting and burn a bit. It is uncomfortable at first. You do get used to it after a while. If you have very sensitive eyes you can leave it out of the recipe. Because the herbal formula is used as an eye wash I made them into tea bags for ease of use. The tea bags filter out most of the solid herb particles, to keep them out of the eye. Mix all the herbs together in a medium bowl. Mix them together thoroughly using a wire whisk, being careful to keep the powders in the bowl. 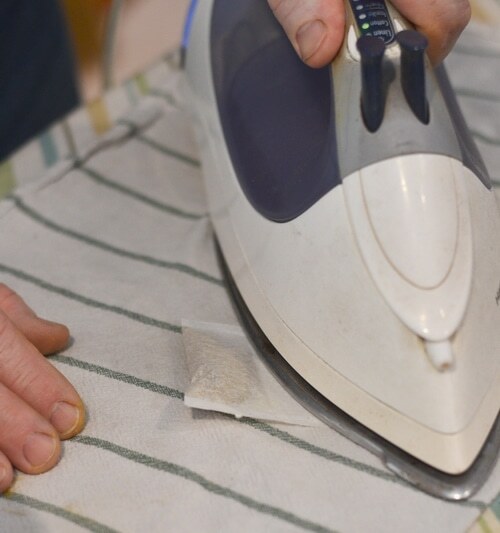 Preheat a steam iron to the cotton setting. 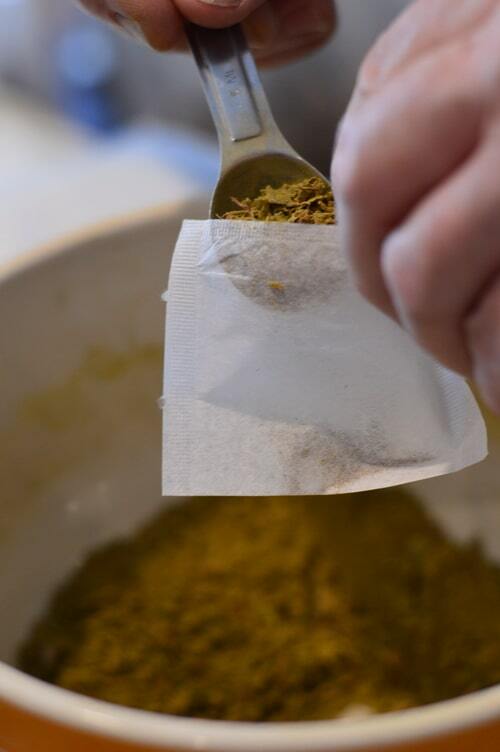 Using a teaspoon measure fill each tea bag with one teaspoon of the eye wash herbs. Iron the open edge of the tea bag with the iron. This will seal the tea bag closed. Check the seal on the tea bag to ensure that it is fully closed before setting it aside. Repeat until all of the herbal mixture has been transferred to the tea bags. 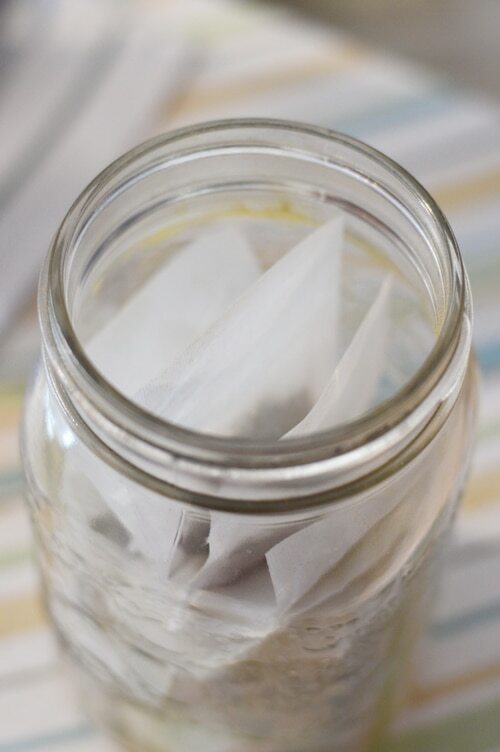 Keep the eye wash tea bags in a closed glass jar. 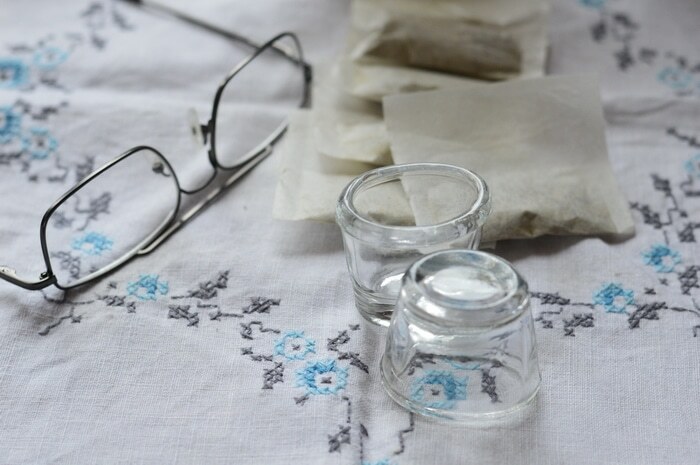 Place an herbal eye wash tea bag in a heat proof mug. Pour boiling water over the tea bag. Cover the mug with a lid. Allow this to steep for 15 minutes. Remove the tea bag. Allow the eye wash to cool to room temperature before using. Do not use this eye wash until it has cooled to room temperature. Fill a sanitized glass eye cup half full of the eye wash. Place the eye cup over the eye and tilt the head backward, so that the eye wash covers the eye. Blink several times as if swimming under water. Try to keep the eye wash over the eye for one minute. Empty the eye cup. Repeat on the second eye using a clean eye cup. Use this eye wash once a day in both eyes. The cayenne may cause a slight burning sensation on the eye in sensitive individuals. John Christopher told his clients, “You will notice a slight burning sensation when you first apply the tea. This results from the cayenne in the combination. Do not be alarmed for this is a perfectly normal reaction and is harmless.” Your eyes will get used to the burning sensation and it will become easier to wash your eyes with the herbal formula with time. If you are very sensitive, you can make the eye wash without the cayenne. 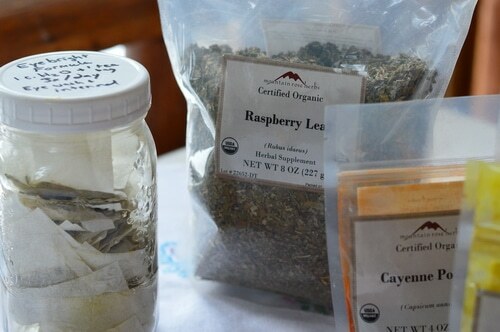 I used the cayenne in my own tea bags because the increase in circulation that it offers was important in our circumstances, and worth the mild discomfort. When you are finished using the eye wash, the remaining eye wash can be drunk like a cooled tea. Internal use of the eye wash is also helpful for the eyes. The eyebright tea bags can also be used to make tea. The formula is effective both internally and topically. Make the tea in the same way you would make the eye wash, by steeping the tea bag in a covered mug for 15 minutes. The tea can be drunk hot or cold. Where to buy the herbs and tea bags? I bought the herbs I used in this recipe from Mountain Rose Herbs, Amazon, and Starwest Botanicals. Does anyone sell bulk eyebright? Starwest Botanicals has it in bulk. Hi, I would love to buy this in tea bags already made, since this level of diy skills isn’t in working order for me. I couldn’t find it to buy anywhere on the links, can you help? I don’t like the premade formula in the bottle because it has alcohol and I think it’s drying out my eyes. I don’t know anyone that sells this. It’s my personal recipe that I make for my husband. You could perhaps ask a local herbalist to make it for you. Or get the ingredients yourself and get a friend to help you. hello, has it been helping mr. joybilee? can you give us an update? Yes. The update: in August 2018 he saw the eye doctor again. His vision improved 2 steps and he need new glasses to compensate. He is no longer on the glaucoma eye drops. His vision quadrant that was affected by the diagnosed glaucoma was improved in the last two eye doctor visits (Doctor said that there must be some mistake). His glaucoma was not caused by high pressure in the eye though. It was caused by lack of circulation due to low blood pressure. His pressure was always low-normal. Prescription drops had no effect. Hello i bought the Christopher eye wash in the bottle ,could you tell me how much drops i should add to the water to wash my eyes, or can i use the drops without water ,thanks for you respond. My email address is simplette52@yahoo.com. I made this, and have used it a few days. Since I wanted to use is immediately, and had none of the iron/seal tea bags, I just used a one serving tea pot and strainer, then used a coffee filter to strain the powdered herbs out. I only used half the amount of cayenne, and it still burns a bit! I also put the herbs to be blended into a clip jar, and then just shook it. When I tied to simply blend with a whisk, the powders just swirled out in puffs of smoke, no matter how carefully I tried! I haven’t used it long enough to see its benefits, but hope to soon. My eyes do seem to feel better after the stinging stops, though. One question: do you use the steam setting (with water) or just dry, when using the cotton setting on the iron? We just use the iron dry when sealing the tea bags. While both contain berberine as the antibacterial constituent, they do have some differences in action. Goldenseal is recommended for anything that is eye related. Oregon grape root is the recommended berberine for anything that is skin related. 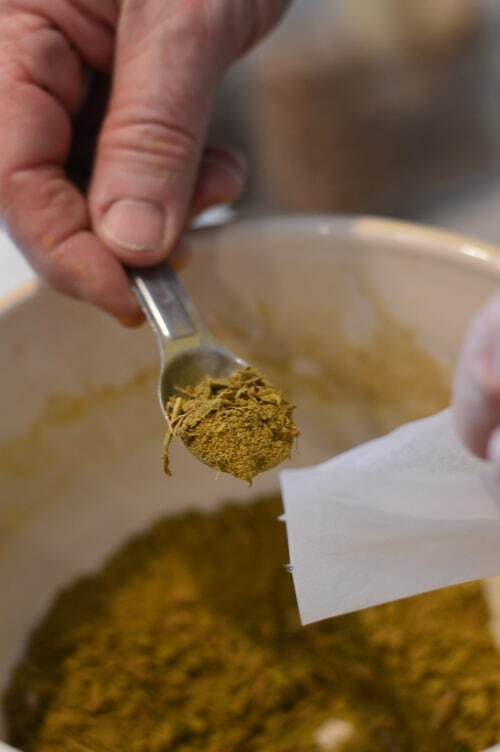 You can source farm raised goldenseal from Mountain Rose Herbs (where I get mine). It’s a little pricey but you only need a tiny amount so very worth it. Hello. I was just wondering if you mean the powdered version of Eyebright? I can’t seem to find the unpowdered (cut & sifted) version. I need to make this soon, but can’t get the main ingredient! MRH is out of stock, and the others only carry the powdered. Use what you can get. Powdered herbs have a shorter shelf life than dried cut herbs so order less if you won’t use it up in 6 months. Dried and cut herbs should last at least a year. I was wondering if I can purchase the formula already made in the teas bags? Nature’s answer eyebright says not to put in eye, even the alcohol free one, . Can u please explain y they said that? Thanks. You’d need to ask the manufacturer. Nothing stronger than regular cayenne pepper. Not the very hot peppers. Help! I have all the herbs for the eyewash to improve eyesight but the eyebright herb. Can I use 400 milligram caps to make the wash? Or do you have a resource where I can get eyebright herb? 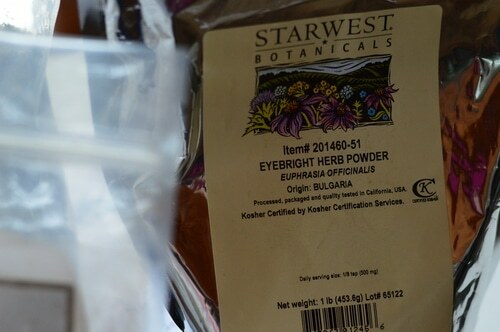 I found eyebright on Amazon from Starwest Botanicals (here: http://amzn.to/2y2wT5Y) and also Mountain Rose Herbs. It’s a key ingredient so I wouldn’t leave it out. Hello I have been reading about Dr. Christopher’s eyewash and bought some off Amazon but I am wondering if the grain alcohol in his eyewash is corn or not. I am gluten intolerant and hope it is corn and not barley or rye. Do you know? I had high pressures and want to try this before my next appointment. All grain alcohols are gluten free because of the distillation process unless there Ian add back at the end like in some scotch whiskey. It’s probable that in a tincture they have used everclear or vodka which even if it was made with gluten wouldnt make it so the end result because of distillation. I think whether it is a concern or not depends on if it’s an allergy or celiacs or a preference. Always check with your doctor for advice in your own personal circumstances. I am so interested to hear the update now that I’ve read your story! 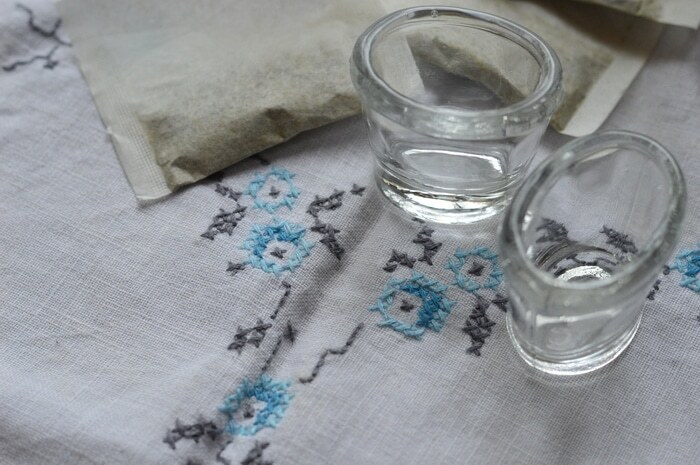 Hi, Was wondering if anyone has a source for a GLASS eye cup specifically for using an eyewash. I bought mine off Amazon.com. The brand is Wholistic Botanicals. How much water should be used with one tea bag? I’m assuming 1 cup? Yes, one cup, but it’s a folk recipe not a prescription. So you don’t have to be too exact, a few ounces either way is fine. Where does one get glass eye cups? This is the one we bought http://amzn.to/2jPx0e0 from Amazon. I did not want to buy any eye glass cups, so I just used 2 shot glasses that I had in the cupboard. Worked like a charm! I wonder if this would work for my dad’s eye issues. I think he’s been having a lot of dry eye problems lately. Whatever is going on, his doctor prescribed eye drops to put in a few times a day. Try it without the cayenne. It might work. But I think the cayenne makes it less likely that people will want to use it, unless they understand the benefits of increasing circulation to the eyes.